The unemployment rate for veterans is at its lowest level since 2008 because these individuals enter the workforce with the expertise, training, and discipline to meet employers’ toughest challenges. And as these individuals transition to the civilian workforce to seek new careers, they are well-suited for key roles in companies across industries. Here are some high-paying professional roles that former military can not only impact, but lead. You need a second career. Industries need your skills. Corporations and small businesses work under the constant threat of a data breach by cybercriminals. As advanced technology continues to accelerate the speed of business, many companies operate with unsecure systems, making them vulnerable. A bachelor’s degree in information technology, systems security, or a related field is required for most positions. Veterans are six times more likely than civilians to work as information security officers. These management roles are ideal for veterans who have strong experience in cyber warfare and evaluating security strategies. Emergency management directors are responsible for developing effective response plans that can be enacted before, during, and after serious threats to public health. These responsibilities can include working with local and national government agencies to provide quick action for natural disaster relief, hazardous waste cleanup, hostage negotiations, and much more. According to the U.S. Bureau of Labor Statistics, the median annual salary for these professionals is $67,330 as of May 2015, with wages reported as high as $127,180. The growth potential for emergency management professionals is also on track with similar public service roles — projected at 6% between 2014 and 2024. During your military service, you were trained to not only exhibit leadership in everything that you do, but to also recognize it in others. That is the core responsibility of a business development manager. These professionals create business plans to boost financial opportunity and build internal cultures that inspire growth in employees. Business development management roles require a bachelor’s degree in business management or a related field, but leadership certifications can also greatly distinguish your value and expertise to employers. 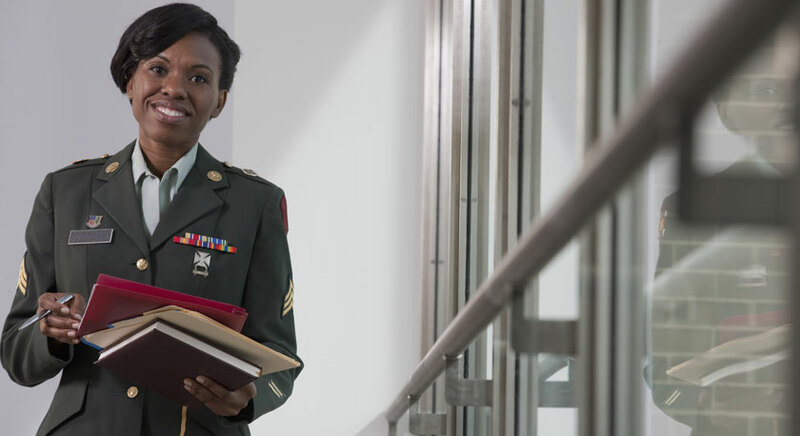 Coupled with required education for some roles, veterans can be the complete package for an employer: a highly trained and educated asset positioning the company for the future. The Unemployment Rate for Veterans Is the Lowest in Seven Years (2016) by Jeffery Sparshott (Article). Payscale: Information Security Officer Salary and Industry Profile (2016) by Payscale (Report). Non-flying Aerospace Careers (2016) by John D. Ruley (Article). Payscale: Air Traffic Controller Salary and Industry Profile (2016) by Payscale (Report). Aviation Control Specialists (2016) by the Federal Aviation Administration (Web Resource). Emergency Management Director Occupational Employment and Wages (2015) by U.S. Bureau of Labor Statistics (Report). Payscale: Business Development Manager Salary and Industry Profile (2016) by Payscale (Report). GPS, drones, microwaves and other everyday technologies born on the battlefield (2014) by Les Scu (Article). Telecommunications Equipment Installers and Repairers Occupational Employment and Wages (2015) by U.S. Bureau of Labor Statistics (Report). Bringing Big Data to the Enterprise (2011) by IBM (Report). Help Wanted: Military Pilots to Fly Commercially (2011) by Anayat Durrani (Article). Veteran Hiring: A Good Business (Bringing Big Data to the Enterprise (2016) by Military.com (Article). Why Hiring Veterans Makes Good Business Sense (2016) by Dori Meinert (Article). Good Jobs for Vets (2010) by the U.S. Department of Labor (Report). Lee is a marketing and communications professional at Context and is also an avid fiction and nonfiction writer. His expertise includes education and social commentary as told through personal narratives. Lee’s work has appeared in Forbes, SUCCESS Magazine, and the Huffington Post. Connect with him on Twitter @Lee_Wms.